Tilapia lake virus (TiLV) is a novel RNA virus resembling Orthomyxovirus. It has been reported as a newly emerging virus that causes syncytial hepatitis of tilapia (SHT) in Israel, Ecuador, Colombia, and Egypt (Ferguson et al. 2014; Eyngor et al. 2014; Bacharach et al. 2016; Del-Pozo et al. 2017, Fathi et al. 2017). The disease caused massive mortality up to 90% in farmed tilapia and is considered to be a potential threat to global tilapia farming (Eyngor et al. 2014). 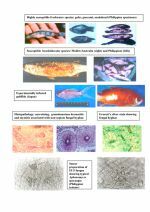 In Thai tilapia farms, disease outbreaks have recently occurred associated with high cumulative mortalities (20-90%), and we have found that the diseased fish show typical histopathological features of SHT. Infection has been confirmed by transmission electron microscopy (TEM), in situ hybridization and high nucleotide sequence identity to TiLV from Israel (Dong et al. 2017). Our research progress was delayed by use of nested RT-PCR primer sequences previously published by Eyngor et al. (2014) together with detailed RT-PCR protocols later released by Tsofack et al. (2016). Our preliminary detection assays performed using the earlier report (Eyngor et al. 2014) with assumed PCR conditions (not specified in the publication) resulted in amplification of nonspecific fish genes. This probably resulted from the fact that 13-18 out of 20 nucleotides for the primer “Nested ext-2” matched fish genes. We, therefore, modified the nested RT-PCR protocols into a semi-nested RT-PCR by omitting the primer “Nested ext-2” to avoid false positive results. The semi-nested RT-PCR protocol given below may be used freely for non-commercial applications to detect TiLV. Heavily-infected samples will generate 2 amplicon bands of 415 bp and 250 bp while lightly-infected samples will generate a single 250-bp amplicon band (Fig. 1). 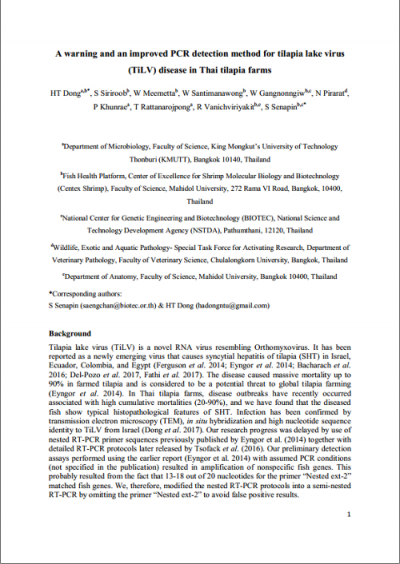 Since this is the first report of TiLV in Asia, the authors urge fish health laboratories in Asia to test for TiLV when abnormal mortality of tilapia occurs. Please contact Centex Shrimp (saengchan 'at' biotec.or.th) to obtain positive control plasmids (pGEM-415_bp), which will be provided free for non-commercial organisations, and for a fee to the private sector.